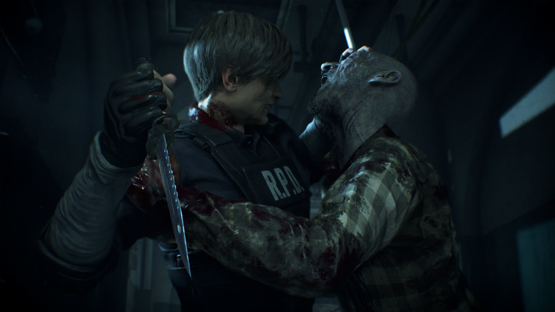 Resident Evil 2 starts with a gruff but upbeat trucker being bitten by zombies, this time with a prolonged scene involving extremely well motion captured burger eating (seriously, this cutscene is unnecessary in the amount of detail, and it’s excellent), setting the scene for the ongoing virus-ridden disaster that it Raccoon City. Leon is in town for his first day of work, despite being told to come later with no more information, which we would have considered with a touch more skepticism. Whilst, Claire is in town looking for her brother, who inexplicably has skipped town without seemingly telling anyone after surviving a zombie outbreak of his own. They both make a quick stop at possibly the most run down gas station in the known universe, which serves as the tutorial of the game, explaining the core mechanics in an odd “baptism by fire” series of events. Escaping this, they both inexplicably continue to head into Raccoon City, into what could easily be described as a bad day for everyone involved. From the point of leaving the service station, the game generally runs similar to the original, hitting the same story beats with the same characters, and throwing things slightly out of order to catch players off guard, such as Mr. X (known in this game simply as Tyrant) being an imposing force in both scenarios instead of just the “B” scenario in the original. Not to say that the events are exactly the same though. Various lesser characters receive a lot of development, explaining more of their motivations, and actually humanising them more than the arguable one-dimensional depictions of before. This keeps the narrative grounded in reality, even considering the wild circumstances surrounding the events. Moment-to-moment, the player is tasked with essentially surviving Raccoon City and what it throws at you. Within this, you will be trying to juggle a restricted inventory, exploring the unnecessarily grandiose Raccoon Police Department, solving puzzles and dispatching (or avoiding) the various denizens of the buildings. 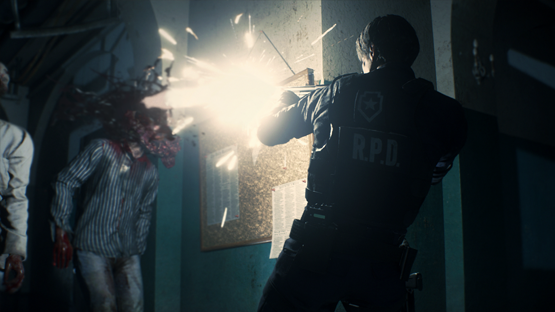 Combat mostly comes down to shooting (aim for the head, trust me), but there’s also the return of the Defensive Items, weapons that have limited uses but can be used to avoid damage if you are grabbed by one of the many creatures of Raccoon City. These are in short supply, but you should always carry one, just to be safe as zombies just don’t stop. 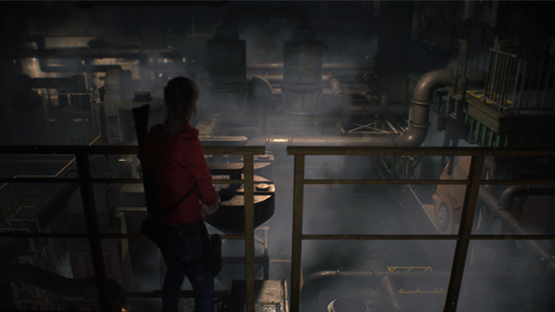 In short, the core focus here is on the survival part of “survival horror” with limited resources available throughout, which you’re going to want to conserve for when they’re needed. To that end, the Item Boxes return, which can be used to store items for later, and a feature has been added that makes exploration so much more natural and considered. Not only will the map change colour once a room has been fully looted (a returning mechanic) but, if you have seen an item but not picked it up, the item will appear on the map with a rough location and what exactly it is, helping you decide whether the trouble of returning to the item will be worth the possible resources used to get there. Speaking of which, the waste of resources is a very real threat, with a poor decision potentially putting the player in severe danger of using unnecessary ammunition, defense weapons, or herbs to escape. The design of the RPD has massively helped with these tense moments, with the differing layout adding to the threat of the unknown felt through every door. The puzzles are standard classic Resident Evil fare, with obscure objects abound that need to be combined, used, or examined to progress. This can be as simple as reading a document that tells you a safe combination, or as complex as finding several objects to combine for use elsewhere, but they are not so complex as to bar your progress in any real way. In fact, there’s a lot more optional puzzles than before here, with only a few needing to be resolved to actually make progress in the game, but it’s advisable to solve all of them if possible, simply because you can find weapon upgrades, side packs to increase your inventory size, or precious ammunition or health if you dare to go for them. 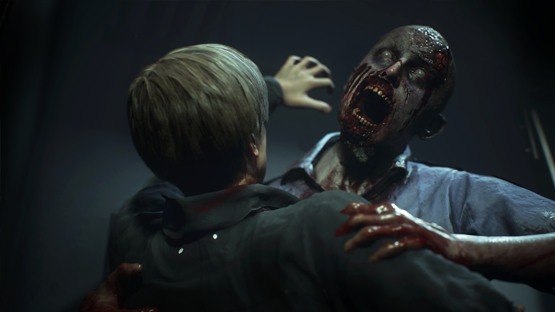 It can’t be ignored how difficult Resident Evil 2 can be, with the zombies being more unpredictable, relentless, and resilient to damage than ever before. Dogs are fierce and fast, closing the distance between you and their jaws in no time. Lickers are just as much trouble as ever, still being blind but being far more powerful if they do hear you. Then there’s Tyrant, an unstoppable threat that will follow you practically to the ends of the earth and/or turn up at random to utterly ruin your day, appearing just when you thought you were safe. It can’t be understated how uneasy and anxious the game can make you feel from the first moment he appears; it’s like an even more relentless Nemesis, and it’s terrifying. 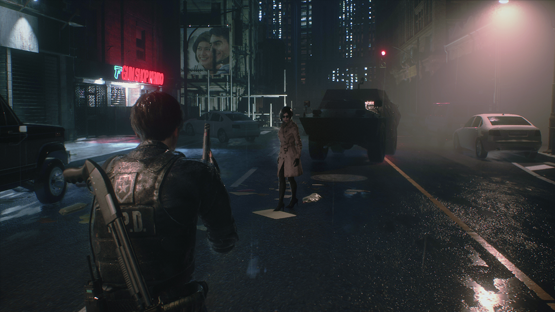 However, if you don’t overly want to deal with the hordes unawares the first time, or if you want a more difficult ride, there are multiple difficulty options available from the start in Resident Evil 2. This hasn’t been the best received change by some, but personally I find that it allows a greater amount of players to enjoy the game, which can only be a good thing. You will be able to finish your first run in a relatively short amount of time, but once you finish the game as either character you unlock the “2nd Run”, which details the events of the game from the other character’s perspective adding other challenges, routes, and essentially completing the story. Note: it’s on the main menu after finishing the first, so don’t miss it! Furthermore, as well as these differing scenarios, you can add on to that the 4th and Tofu Survivor scenarios, which give an additional (and not to mention challenging) fresh take on the events and mechanics of the game. It wouldn’t be too much of a stretch to say that there’s a considerable amount of playable content here. This content is only bolstered by the multiple concept art pieces and full 3D models that can be unlocked through playing the game and completing certain specific criteria. A lot of these are just unlocked through progress, but there are those that need to be sought out, such as shooting the Tyrant’s hat off; so there is a lot of replayability for what is quite a short game. 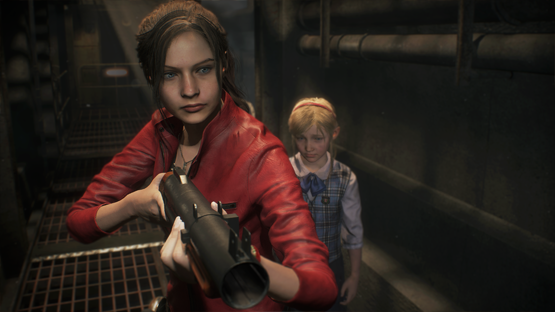 In short, the gameplay of Resident Evil 2 could easily be summed up as a “best of” for the entire franchise, taking some of the more ingenious or beneficial mechanics from previous games in the series and fitting them lovingly within the confines of Leon and Claire’s original magical journey through the worryingly insecure Police Station. For example, we have the camera and movement of the more active post-Resident Evil 4 titles, the inventory management and user interface of Resident Evil 7, and the quality of life changes (like the Defense Weapons) from the REmake. As such, this title feels like a culmination of everything that Capcom have learned about the series so far. Visually, this title is absolutely breathtaking with everything looking realistic and grounded, giving the game an air of believability and aligning all of the events contained within closer to that of what the original felt like back in 1998. The attention to detail is incredible, making the Police Station and every other location actually look and feel like real life places to explore. The character models are fantastic and expressive, with some absolutely excellent motion capture work on display here, and the monsters themselves are gloriously vile to behold. The zombies in particular look fantastic, with so many variations that it doesn’t feel like a single one of the shambling corpses is repeated. Where the game truly shines though is in its sound design. Every aspect of this is sublime from the superb voice acting through to the atmospheric new score, everything has improved. This can be best seen in the design of the Tyrant, where the sounds of his pursuit can be heard in the distance and, if interpreted correctly, can be used to avoid him. 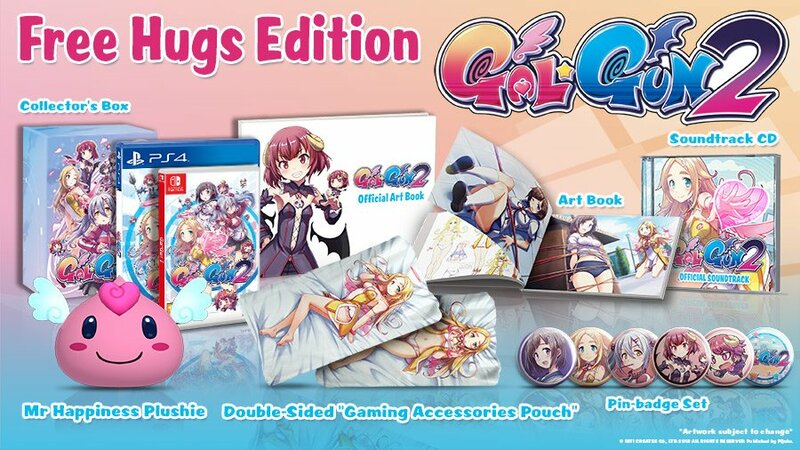 Also, for those that have purchased the Deluxe Edition of the game, there is the option of playing the entire game with the original score and sound effects, adding a slight layer of warm familiarity to the markedly less welcoming surroundings. There truly isn’t anything quite like the music that plays in the Save Rooms, after all. 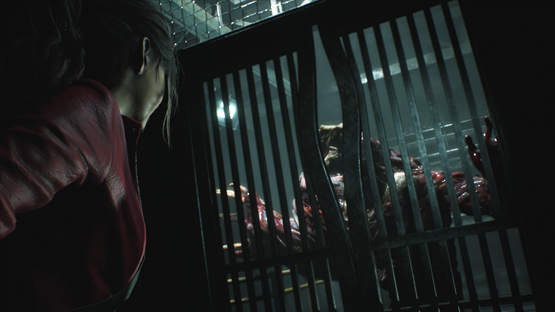 Resident Evil 2 is a phenomenal achievement, taking the familiar setting and distorting it just far enough to inspire a large healthy dose of unease. 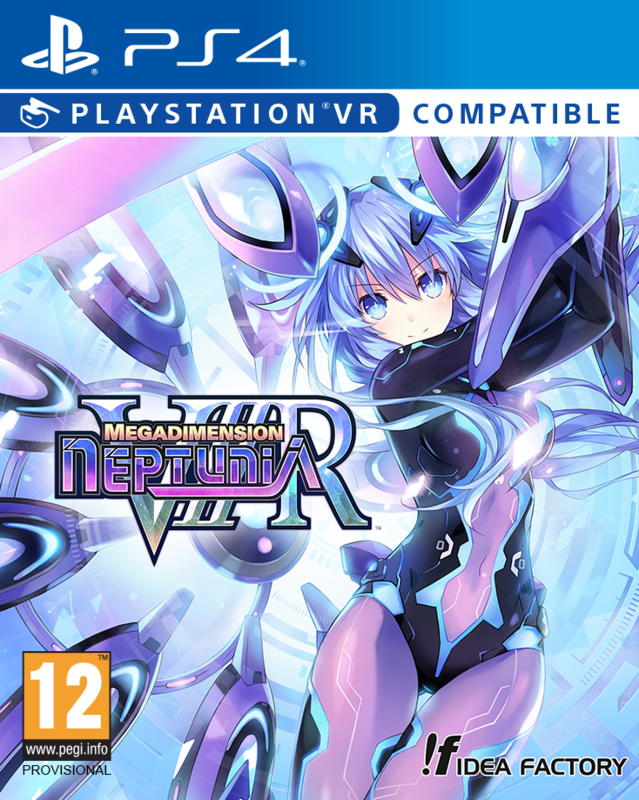 Every aspect of the original title has been upgraded from the visuals to the gameplay, bringing an arguably iconic Playstation title up to date and making it suitable for long time fans and those fresh to the series. 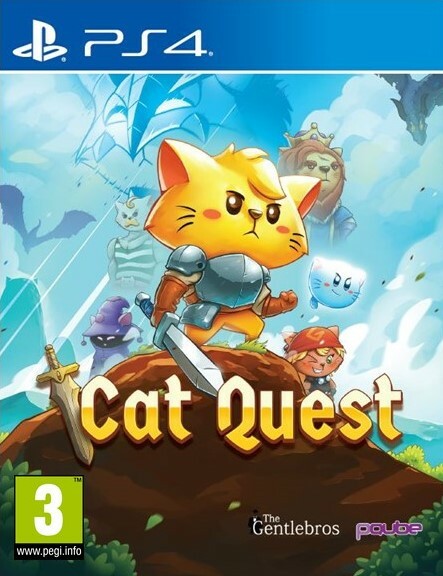 Capcom have created something that is very much its own beast, whilst remaining stringently faithful to the original title. 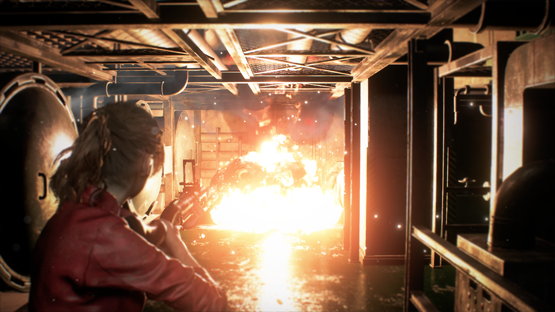 They say that lightning doesn’t strike twice, but Capcom have managed it with Resident Evil 2 bettering both the original title, and the phenomenal Resident Evil REmake with one clawed swipe. 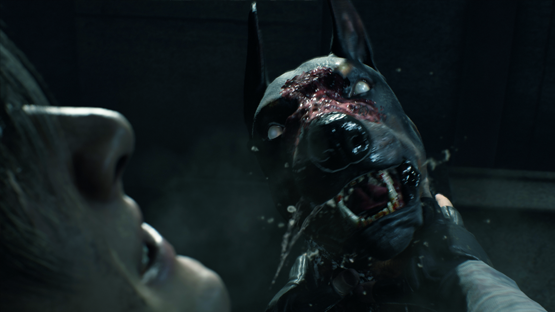 Survival horror is back, and it has never been more terrifying.